With the time, it is natural that the company assets started to lose its importance. This process is termed as depreciation. With the decrement in the value of assets and hence price of the same assets is noted down in the balance sheet as depreciation amount. If we talk in the terms of accounts, depreciation is the reduction of the cost of assets that have been recorded during the time of purchase. This is done in a fixed manner till the cost turns to negligible or zero. It can easily be explained with the help of depreciation formula and examples. For instance, furniture, building, machinery and office equipment falls under the category of fixed asset. The land is also a part of a fixed asset but it won’t be counted as depreciated as the value of land increases with time. The depreciation value is determined by the actual cost of the asset and the revenue generated by that asset. As per the matching principle, this rule is obligatory as the related expenses on the asset are recorded with the total revenue while you are using that asset. 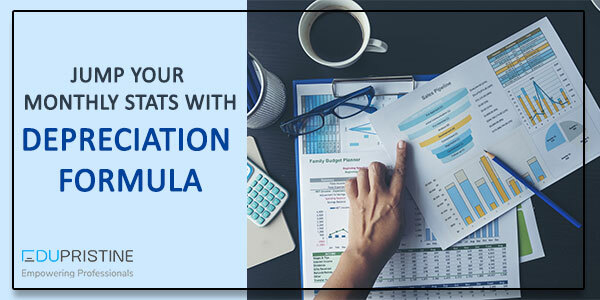 This will help you to get all the important information related to the transaction related to the revenue that can be stored in as depreciation formula finance. In order to calculate the depreciation value, you must have few important input values. It is a price that is determined as the selling price of an asset. It is natural for a company owner to sell out the fixed asset after a certain period of time. However, the asset will not be sold at the purchasing price but the reduced price will be the selling cost. The selling cost will be the salvage cost of that particular asset. The cost will decrease with time as the depreciation will decrease. The life at which the asset is being productive for a company will be counted as the user, However, once the asset passed the limit of productive time, it will fall under the not cost-effective criteria as it won’t be able to perform basic operation steadily. This cost is a combination of so many things including the actual cost of the asset, shipping, taxes, cost of setup and preparation cost. However, for calculating the depreciation formula economics you must be aware of the ways in which you can determine the cost of depreciation and which will be best for you. There is three type of depreciation method. It is a bit longer process as compared to straight-line method. In this, you will fix the expense price on the each unit manufactured. You can easily assemble the production lines by using this method. The output capability will determine the value of depreciation rather than the total years. This is the common method used by companies to determine the cost of depreciation accurately. A company can easily description the expenditures of a fixed asset. Another name of this method is accelerated depreciation method. As per the name, the formula calculates the value twice as much as the book worth of an asset per year. Here gathered depreciation or accumulated depreciation is the total value of depreciation on asset that is collected within precise time. Why Keep A Depreciation Record? Since we know the meaning, values needed to calculate the exact value and depreciation formula business, it will be easy to calculate the accurate value. But many people might stuck on the question that why do you need to keep a record of depreciation value. Well, here is the answer to all. Since you know the meaning and importance of depreciation value, it is simply calculated to cup tie the cost of an asset over the dynamic life and the total revenue earned on an asset. You can actually combine the cost of revenue and asset together. In this case, the number of years the asset was productive. The useful life of an asset determines the total cost through which the balance sheet cost shifted to the financial statement. You can say that it is simply a principle to match the allocation of an asset to easily determine the actual value of that particular asset. If in case people don’t use the depreciation method then it becomes important to charge the expenses during the time an asset was bought. However, this method can make you fall into loss during the transaction phase and profitability period without an offset expense. Therefore, if a company is not calculating the depreciation value then the front-loaded expenses and the variable financial cost will increase immensely. Depreciation value helps to easily determine the income statement and prepare an accurate balance sheet with the profitable revenue. Basically, depreciation formula and examples are just a way to prepare a report. And that can calculate the actual profit obtained in the business. There are many accounting software’s that can help you out if you are struck. This will help you to maintain the proper depreciation value by minimising the small errors that can happen with manual bookkeeping work while preparing invoices and calculating taxes.